In 2013, he was ready to add one more role to that list – business owner. Robert worked for EPR Properties as the firm’s Vice President of Transactions and Associate General Counsel. Throughout his years at EPR Properties, Robert saw a lot of entrepreneurs walk through the door seeking financing for the real estate portion of their business. These entrepreneurs were generally successful and enjoyed what they did. Robert wanted to be one of them. He was ready to leave EPR Properties and was looking for options for his next adventure. 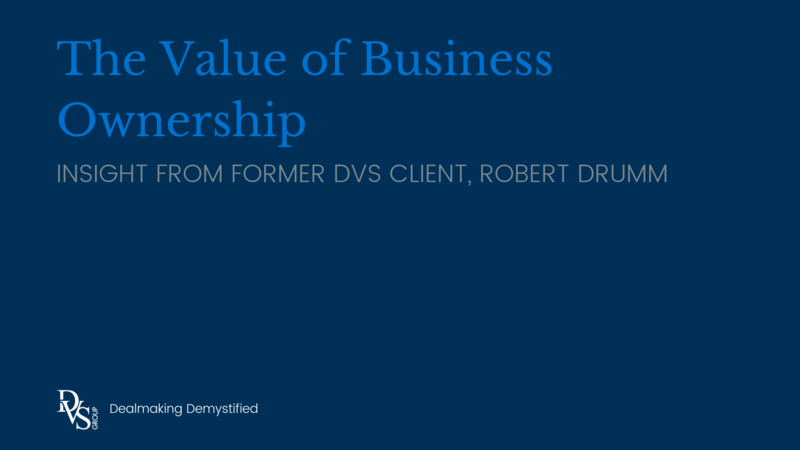 Robert retained The DVS Group as his advisor for his acquisition search. The business was called Atlas Labels & Packaging, and Robert pursued an acquisition. For Robert business ownership was a valuable experience. He grew the company through a major rebranding, increased sales, additional staff, and the implementation of new business processes. After four years at the helm, the business had doubled, and Robert knew it was time to let someone else take Atlas through the next growth phase. Robert called Kevin to tell him that he was considering selling the business. Kevin connected with a few potential buyers he thought might be interested in Atlas. One of those options ended up being the right fit. After Kevin set the stage with preliminary information and a face-to-face meeting, the sale process began and in four months the deal closed. Again, Robert chose to do much of his own deal work throughout the process with input from The DVS Group as questions arose in preparing for due diligence and in negotiations. “I went into something I knew. I had worked in packaging before going law school. I had been in and around the adult beverage industry as a lawyer. I was a homebrewer who could hold up my end of a conversation with a professional brewer. All that was a huge advantage to me from the beginning. Because it requires increased responsibility and increased risk, business ownership provides a valuable perspective that you can’t find in any other role. Robert’s ownership journey brought him to Atlas and through hard work, he left the company better than he found it and the experience left him better than when he started. Where will your ownership journey bring you? We welcome the opportunity to have a confidential conversation with you – wherever you are in your buying or selling journey. Contact us here.